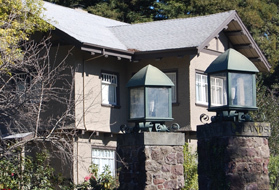 Construction at Oak Knoll is temporarily paused until April 15 due to a City of Oakland ordinance prohibiting grading during the rainy season, but there is a system in place to manage the rainfall on the site during this wet time of year. 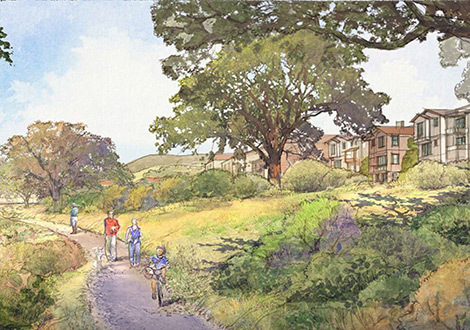 Nestled at the base of Oakland's southern foothills, the Oak Knoll community is the culmination of a collaborative effort on the part of the City of Oakland, residents and developer SunCal to reinvigorate and revitalize one of the most significant properties in the Bay Area. 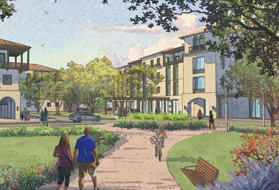 Located on site of the former Oak Knoll Naval Hospital, Oak Knoll will be a pedestrian-friendly plan oriented around a restored creek for a highly livable community. For 54 years, the Naval Hospital treated American servicemen including those wounded during WWII, the Korean War and Vietnam. It was closed in 1996 and sat vacant for another 16 years during which time the site and its buildings were vandalized and left in extreme disrepair. SunCal is excited to be part of the transformation of this unique property and honoring the history of this important place. The transformation of this site into vibrant neighborhoods, open spaces and public parks is a collective vision created in collaboration with the surrounding community. Community information, including facilities, uses, availability and amenities, are subject to change at any time without notice or obligation. Illustrations, photographs, square footages and features are approximate for illustration purposes only. Multiple public agencies have authority over water discharge at Oak Knoll and Rifle Range Creek. 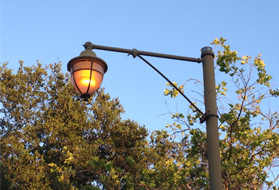 They are the Environmental Protection Agency, San Francisco Bay Regional Water Quality Control Board, the California Department of Fish and Wildlife, and the City of Oakland. These agencies previously reviewed and approved Oak Knoll’s Erosion and Sediment Control Plan under the California General Permit for Construction.